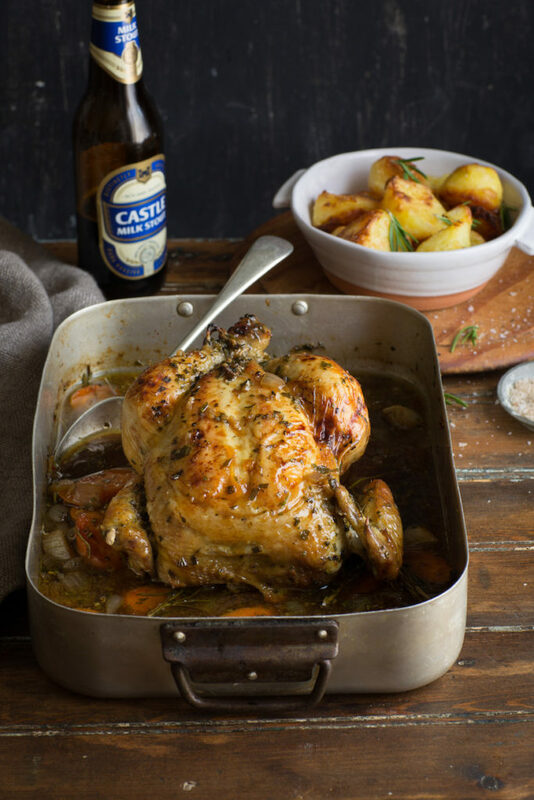 Top South African food stylist and Drizzle and Dip blogger, Sam Linsell uses a secret ingredient to her all-time favourite roast chicken recipe that results in the most succulent bird. “Instead of using wine or verjuice, I have adapted the recipe with Castle Milk Stout,” said Sam. The onions and carrots, which roast slowly with the chicken and the honey adds a sweet element to offset the bitterness of the stout. The beer adds a rich savoury flavour to the sauce, which reduces to a delicious jus to serve with the meat. “It is so delicious, you will grab a spoon and sip it like a broth”. Pre-heat the oven to 200 C / 400F. Place the chicken, onions and carrots in a deep-sided roasting pan. Mix all the liquid, mustard, honey, garlic and herbs together and pour this sauce over the chickens and into the cavity. Drizzle over the olive oil and season the chicken with salt and pepper. Roast uncovered for 1 1/2 hours and until the chicken is cooked.Turn the chicken over half way through so that the underside gets golden brown and crispy too. Finish it off with a last browning on the breast side at the end. Strain the pan juices, onion and carrot and use this delicious jus as your gravy.